If you want to start a blog, there is a lot to consider. A blog name generator is a tool that can help you come up with a domain name for your blog, a name that could eventually become the defining characteristic your brand is known by. How you go about choosing a domain or blog name for your brand is a highly debated topic, which is why we'll be touching base on both of them in this post. We'll go over the things you should consider when it comes to picking a name as well as how you can use a blog name generator to come up with a decent-sized list of names. Let's get to it. Keywords in domain names. This is one of those “highly-debated topics” we mentioned earlier. Some say keywords in domains matter, others say they don't. 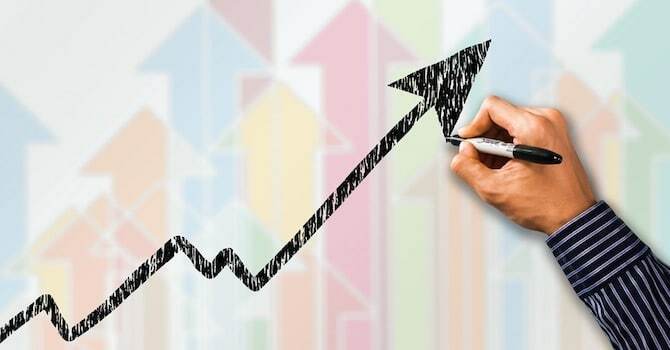 The fact of the matter is keywords used in domains are used as ranking factors, but those keywords alone won't help your domain rank in search engines. Having a keyword that relates to your niche in the domain name of your site can help it rank, but only when it's complemented with a site that meets Google's other ranking factors. These include having a site with a mobile-friendly design that performs well and features high-quality content. Basically, don't use a keyword in your domain and expect to get away with having a poorly-designed website with thin, poorly-written content. Blogging is a business, and your blog has the potential to become the next big brand in your niche. That's why you need to choose a name that's memorable and “brandable”. Does the name of your brand need to relate to your niche? Not necessarily. You've heard of these companies, right? These are some of the highest-valued brands in the world, and none of them have a name that gives you the slightest indication of what they're business is about. You probably noticed a trend in the list of big-name brands showcased above. 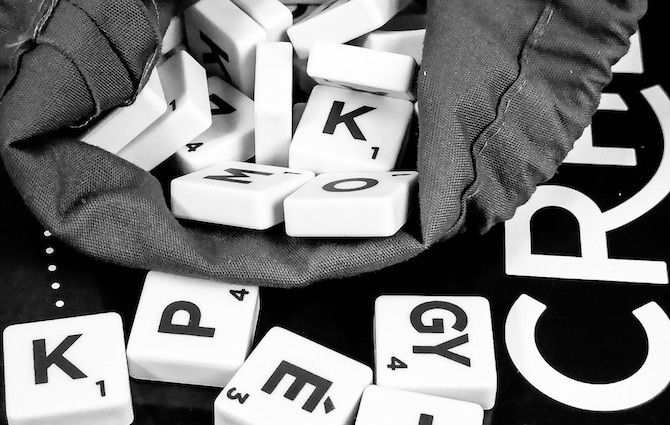 They all use one word, giving them short, sweet and simple names to build their brands off of. Consider using this protocol as well, especially with a blog. Think about it. What's easier to remember, footballisthegreatestsportofalltime.com or fbgoat.com? You should also avoid using hyphens and other characters as well as complicated numbers with too many syllables. 99designs is a great name. 967designs is not. The name you choose for your blog should also reflect the tone of its content. If you use a humorous tone that's meant to entertain, your blog name should have a similar amount of wit. 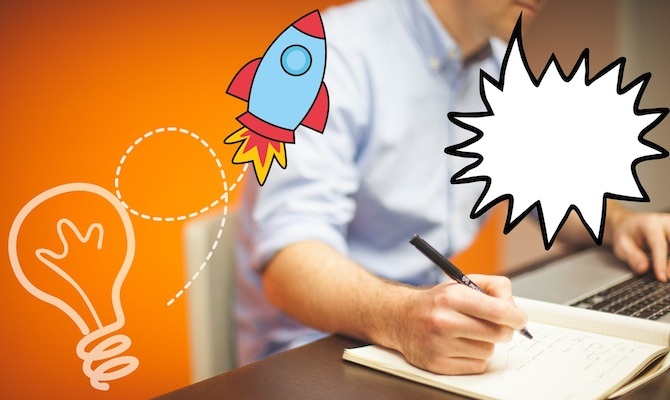 If your content is meant to inspire, your blog name should reflect that. 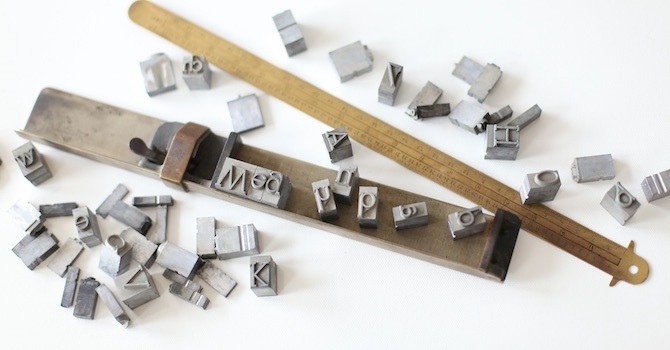 Your brand should be unique, and so should your blog name. Users shouldn't be able to confuse it with another brand's name. This is why you should avoid using the other domain extensions if the .com version of the domain name you want is unavailable. After you decide on a name, do your research, and make sure no one else uses a name that's too similar to yours. 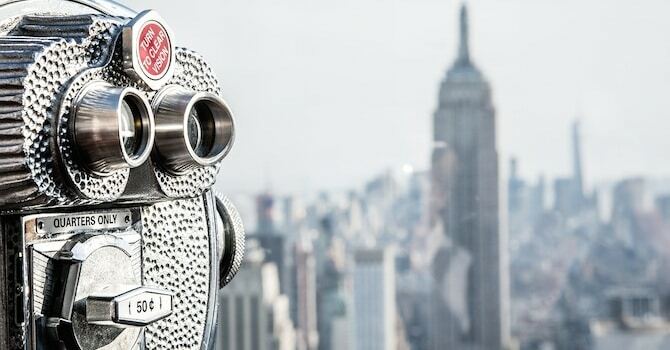 Perform keyword research for your entire niche before hitting the blog name generators. This research should include checking what your competitors rank for using a tool like SEMrush. You've probably heard of house flippers, people who purchase run-down houses for cheap, fix them up and resell them at higher prices. There's a niche business that does the same with domain names. They'll buy a domain for a few dollars and jack the price up to four and five-figure prices. Don't get roped into these tactics. While there are plenty of businesses who can afford to pay for domains at those prices, a brand new blog is not one of them. 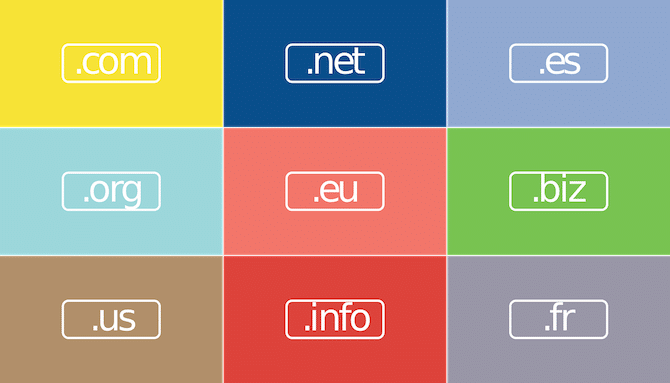 You're usually better off registering your domain with a service like Namecheap or GoDaddy. 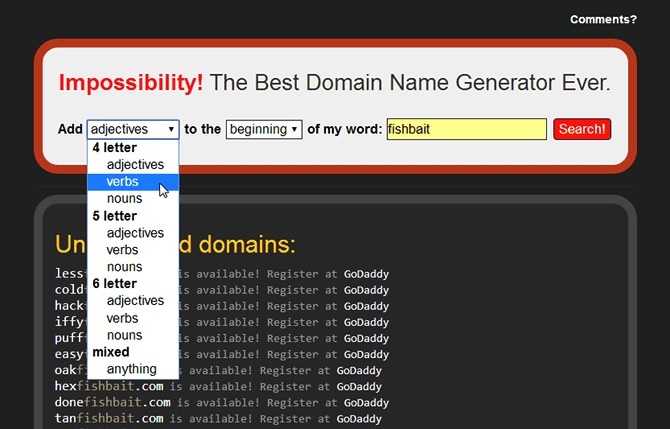 Nameboy is a simple domain name generator that can be used as a blog name generator. 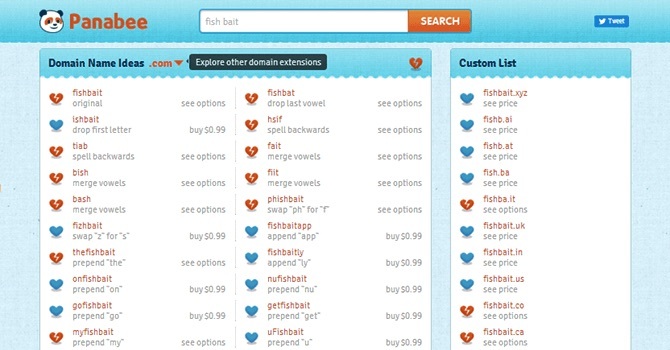 It allows you to search available (and unavailable) domain names using one to two keywords. You can search for “available” .com domains, which means they haven't been registered yet, by looking for green squares on the far left-hand side of the grid. Refer to the legend at the top of the screen if you're not sure about what each color means. All available domains also have check boxes inside of them. This is meant to make it easier for you to add the domain(s) to your cart, but it also makes this tool color-blind friendly. Lean Domain Search is another domain name generator that can be used as a blog name generator. When you generate names using a particular keyword, you'll find the names color coded based on their availability. You can even sort the results by popularity and length, or switch up the results so the keyword you entered shows up at the start of names and vice versa. The site is owned by Automattic, so you'll get an option to register your domain and create your own site/blog at WordPress.com if you click on an available name. You will, however, also see options for registering the domain with services like Bluehost, GoDaddy and Namecheap. Impossibility is another simple domain name generator. 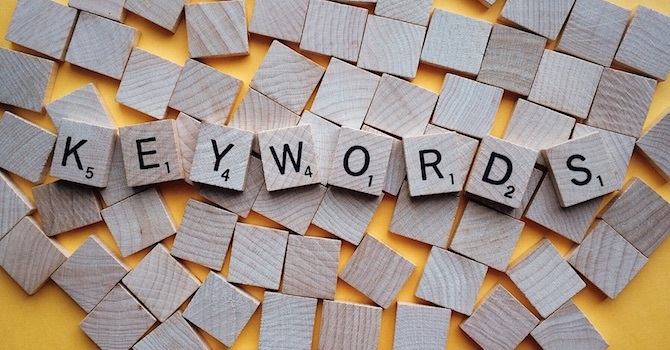 All you need to do is enter your keyword as one word in the search field, select the length of the additional words you'd like to generate, the type of additional words you'd like to generate as well as where you'd like the additional words to be generated. The site generates unregistered domains from GoDaddy, so you'll have the confidence in knowing the names generated for you are all available. Name Mesh is a fun and unique domain generator that definitely knows how to separate itself from the crowd. Instead of taking your raw keyword and adding words to it, it takes that raw keyword and “meshes” it to create unique alternatives. This makes it a great blog name generator as well. 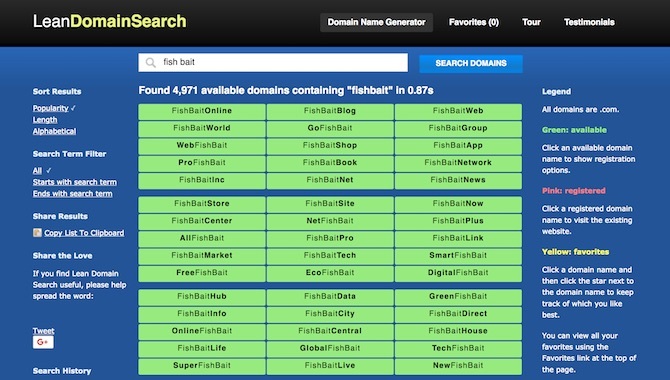 You can see the “fish bait” keyword generated into such domain names as fishbaitr.com, fishabait.com and ifishbait.com. There aren't many ways to filter the names the tool generates, unfortunately. 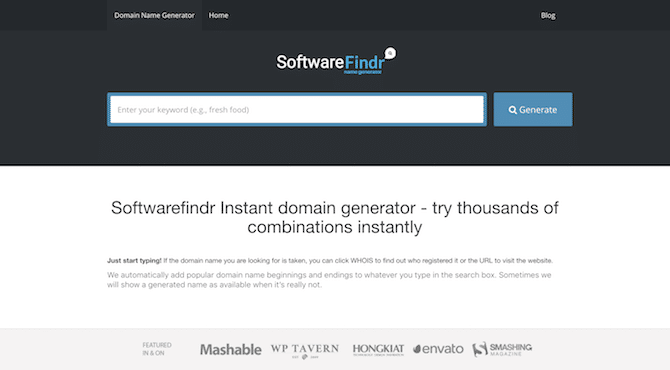 Softwarefindr is an instant blog and domain name generator which you can use to try thousands of combinations instantly. You just need to type in the domain name you're looking for and the tool will tell you if the domain is taken or not. The domain name tool will also suggest alternative domain names based on your input. This tool is sufficient to perform a quick domain lookup. 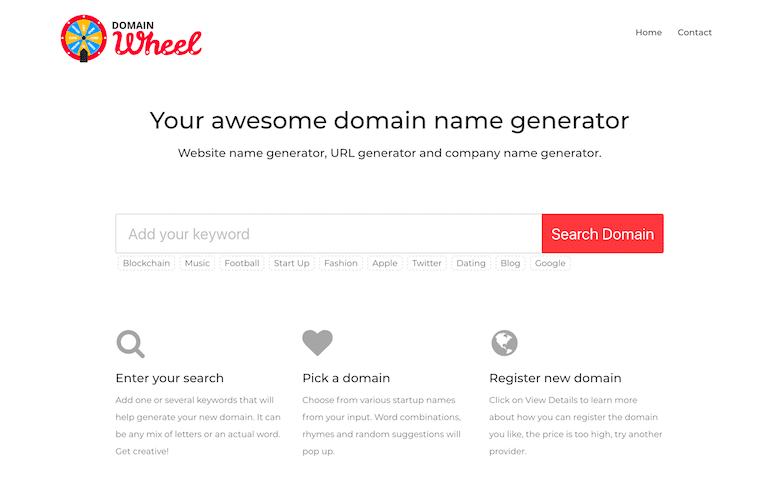 DomainWheel is a cool website name generator, URL generator and company name generator. 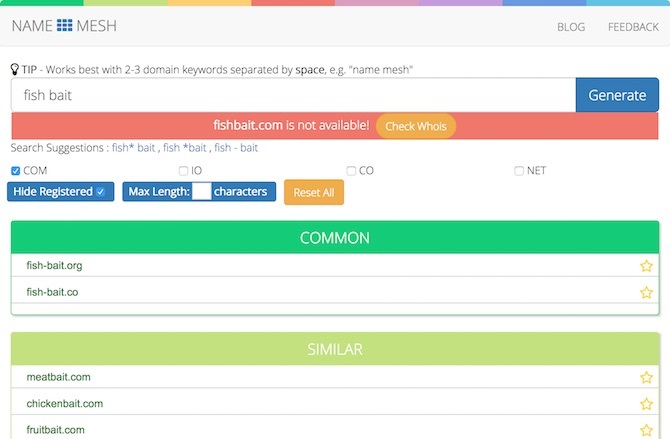 This tool combines popular APIs from GoDaddy and DomainsBot for domain suggestions to make sure they're giving the best results. On top of that they recommend different keyword ideas. 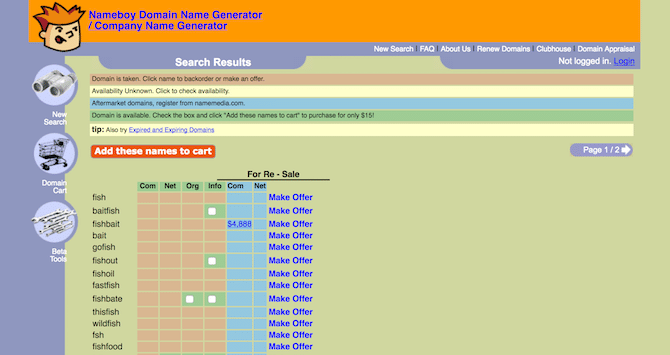 Overall, DomainWheel is a worthy competitor for other existing blog name generator solutions. Panabee is another domain name generator that doubles as a blog name generator. It's similar to Name Mesh in that it focuses on offering cool, unique and fun alternatives of your desired name based on the provided keyword. It shows .com domains by default, but you can set it to display names from dozens of different extensions. 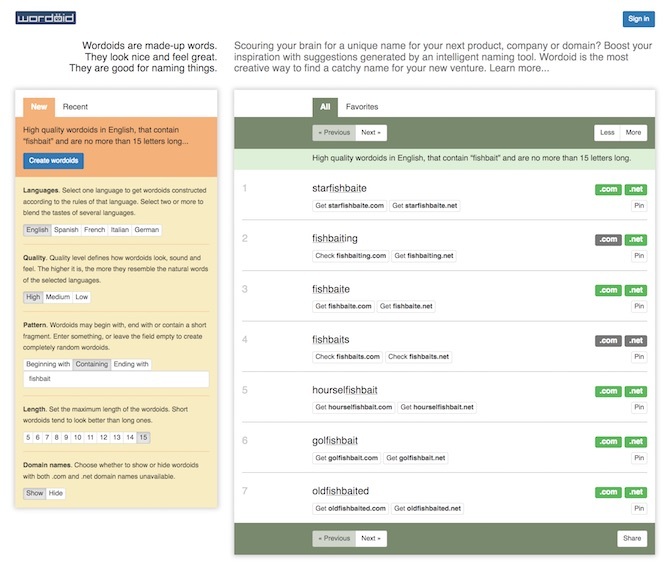 WORDOID is a lightweight domain name generator that can be a fairly useful blog name generator. All you need to do is enter your keyword as one word, select the language you'd like your name to appear as, select a quality rating, choose where you'd like the keyword to appear and how long the name should be. You can reveal more domain names by clicking the More or Next buttons. Hopefully, you've created a fairly lengthy list of possible blog names to use. If you can't find a name you like using a blog name generator alone, there are a number of additional techniques you can use to find a perfect match. The first is a literary trick called alliteration, which contains a repetition in consonants or sounds, such as flyfishbaitfly.com instead of flyfishbait.com. You can also add an abbreviation to one of your generated names. 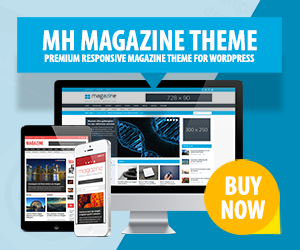 That's what this site's founder, Michael Hebenstreit did with MH Themes. It's also what a lot of WordPress-related sites did with their domain names using “wp”. You can also use a thesaurus to find similar versions of words, or even go as far as using the foreign version of a particular word. If all of that fails to catch your attention, go the simple route, and use your own name! Thank you very much for this awesome article! The suggested generators will be extremely helpful to find good blog names for my next blogging ventures. I’ve spent days on how to come up with a blog name for my new project. These blog name generators have been very helpful to move forward. Thanks for the roundup. The blog name is essential since it shows the idea behind your business or blog. Keywords, meta tags, blog title and anything else matters when you create a blog. Thanks for covering everything related to blog names. I think you can choose any WordPress blog’s name as long as it suits your purpose. But ensure that the reader understands what your blog is about! Yes, as long as you find a unique, creative and suitable name for a blog, there certainly are almost no limits. However, it would be highly recommended to research a name first because it could potentially violate brand names or conflict with other websites and businesses.